Build the template for speedy call logging! A SupportDesk QuickCall is a helpdesk call template for creating a re-usable template for frequent or repeat incidents and requests. You can use QuickCalls to build up a portfolio of common calls, providing a swift way of completing the ticket details. In conjunction with HouseForms, you can associate a Form with a QuickCall for logging specialist issues, such as a ‘New Starter’ or Equipment Request’. The advantage of building up your helpdesk call template portfolio (QuickCall list), is to enable service desk support agents to quickly and simply log common or repeat tickets. You can ensure that essential data is included on the ticket, such as the Priority of the call, SLAs, categorisations, and you can even pre-populate the subject field. This means that you can enter a long description of what the call is about, which can be submitted as it is, or helpdesk agents can edit the text if necessary. 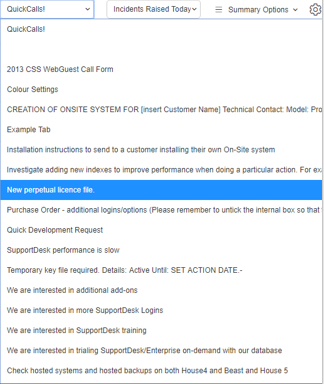 QuickCall Helpdesk call templates can also be created in SupportDesk for individual service desk processes. It is possible to lock QuickCalls into specific processes, so that templates can be created in accordance with the requirements of the process. This is useful, as Incident Management, Request Fulfilment, Change Management, Problem Management etc. utilise different categorisations and workflows. Save time in the call logging process by pre-populating specific fields of common or repeating call types. Ensure that essential data is captured. Create a list of QuickCalls for instant call creation. Associate QuickCall helpdesk call templates with individual service desk processes and restrict to specific folders.